The flu strikes a significant number of individuals every year, and it’s quite random in its choice – it can strike the healthiest, fittest and most physically active individual down with one blow, and it can also strike the elderly, the young, and everyone else in between. Everyone has had the flu, and although some may swear by certain flu remedies, there are some remedies which have been proven to ease the symptoms of this bothersome illness. Do you have the flu and are trying to look for ways to ease your symptoms? Here’s what you should know. The first rule for anyone who has the flu is to get some rest. Once you feel the onset of the flu with symptoms such as a cough, fever, headache, chills, body fatigue, and so on – you should contact your workplace or school and tell them you will take a day off. No ifs or buts – one of the best cures for the flu is simple bed rest. You don’t have to be bored whilst lying down, either – you can watch some television, read, or simply take a nap; your body needs it, and you’ll feel better after you’ve done it. When you have the flu, you may become dehydrated as well, especially if you have symptoms of diarrhoea. Make sure to hydrate; drink lots of fluids, be it water, fruit juice, a sports beverage, or soup. The great aspect about fluids is that they allow your respiratory system to stay hydrated, which, in turn, helps you breathe more easily and relieves that sore and dry throat. If you have fever as well, this is your body’s way of fighting off the flu virus. You can take some medication to treat your fever, and these medications can be bought over the counter – such as ibuprofen and acetaminophen. Bear in mind, however, that you should not give any aspirin to those who are below 19 years of age. 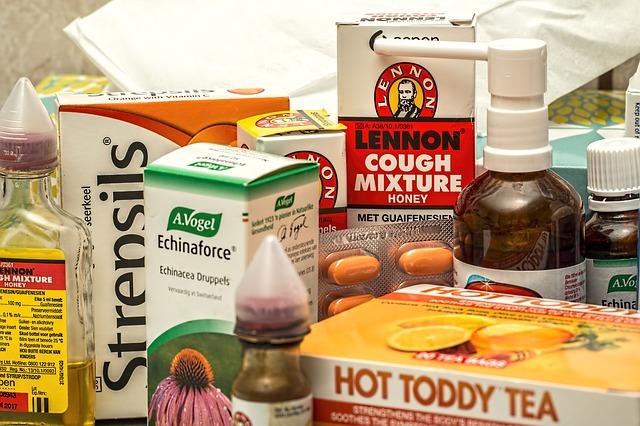 For a cough, you can also take medication, such as an expectorant. The expectorant helps loosen the mucus in your respiratory system, so it will be easier to cough up. Note that children below the age of 4 should not be given any over the counter cold or cough medicine. Steam has proven benefits when it comes to alleviating some symptoms of the flu. Simply fill your bathroom basin or a large bowl with hot water and add one teaspoon of a menthol rub. Then just breathe in the mist or steam that is formed. Do this for a few minutes. This home remedy can help clear your airways and reduce congestion, making it easier for you to breathe. If your flu symptoms worsen or don’t seem to get better after a day or two, it may be time to consult a doctor; you may need antiviral medicine which the doctor can prescribe. There is now a Dr app online where you can communicate directly with a doctor, so there’s no need for you to go out or visit a clinic, saving you time and effort as well as expense. The doctor should be able to recommend a good antiviral medicine to treat your flu.